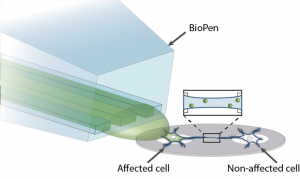 The BioPen (formerly the Multifunctional pipette) was utilized to target individual cells within interconnected networks, to investigate the cell-cell connections which spanned fabricated Teflon structures. Intercellular transport between HEK 293 cells, expressing the ion channel TRPM8, was measured by monitoring the changes in calcium concentration within individual cells. Menthol, in the presence of a Ca2+ spiked buffer solution, was delivered to one cell in a network to activate the TRPM8 ion channels. Utilizing the pre-fluorescent dye Calcium green-1, allows Ca2+ ion transport though the connections to be visualized and monitored. Measurement of the molecular transport, enabled the characteristics of cell protrusions crossing small microgaps to be established.